With iOS 8, Notification Center gives you an at-a-glance, timely view of everything you want to keep on top of: new emails, texts, the current temperature, appointments and reminders, tweets, and more. To display Notification Center, drag it down like a window shade from the top of the screen — even from the phone’s Lock screen. Notifications are grouped by category, such as Mail message notifications, missed phone call notifications, and notifications from apps (with your prior permission). For example, all USA TODAY notifications — typically headlines of breaking news — are with other USA TODAY notifications, rather than being mixed in with the financial tidbit notifications you might get from, say, CNBC. Notification Center and the notifications processes improved in iOS 8. For starters, notifications are now interactive or actionable; that is, you can respond to them immediately. For example, you can accept or decline a Calendar invitation. Without leaving the app you’re working in, you can reply to an email or message. Inside Notification Center, meanwhile, you can mark off reminders from your to-do list. 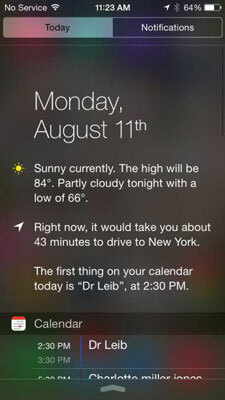 The today view in Notification Center displays only notifications pertaining to the day you are viewing. Makes perfect sense. That way, you’ll know whether to don a raincoat or run out and buy a last-minute birthday gift for your officemate who is celebrating the big Four-O. The today view can also give you a quick summary of what you’ve got going on tomorrow. In iOS 8, if you scroll to the bottom of the today view, you can tap a new Edit button that gives you a bit more control over the items listed in your today view and the order in which those listings appear. You can remove the notifications you see in this view (or not) and rearrange the order in which the Stocks, Calendar, and Reminders appear, but not the order of the Today Summary, Traffic Conditions, or Tomorrow Summary. You can add notifications to the today view from some third-party apps as well. The today view is especially useful for the here and now, but you can still tap the Notifications tab to see your other notifications, even the long-term ones. Meanwhile, with iOS 8, Apple also opened up Notification Center to third-party developers, enabling you to respond to notifications from some of your favorite apps. To dismiss notifications, tap the circled X in a notification category or group, such as the aforementioned USA TODAY or CNBC notification, and tap Clear. And to dismiss individual notifications within a group, swipe the notification from right to left and tap either Mark as Read or Trash. Although it’s useful to keep tabs on all this stuff, you don’t want to be hit over the head with information. So Apple delivers notifications unobtrusively by displaying banners at the top of the screen that then disappear until you actively choose to view them. And when you want to do just that, you can summon Notification Center just by swiping down from the top of the screen. You can also choose which notifications you will see. Tap Settings→Notifications and then tap the notifications you want to see. What’s more, you can customize the way those notifications appear. For example, in Settings, tap Reminders under the list of apps and widgets that you can include in Notification Center. You can decide whether reminders should appear in Notification Center and indicate whether you want to see just a single reminder item, up to five reminders, or up to ten of these items. Next, choose an alert style: whether such reminder notifications appear as a banner at the top of the screen that disappears automatically or as an alert that requires your response before you can do anything else. 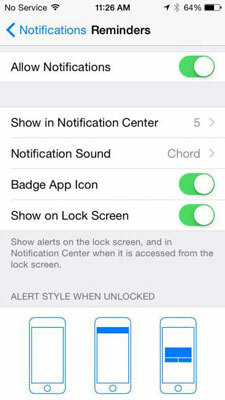 You also get to decide whether to receive reminder notifications when your phone is locked. If you don’t want to be bothered with notifications at all, turn on the Do Not Disturb option in Settings or via the Control Center. When enabled, alerts that would otherwise grab your attention will be silenced. You can even schedule the time that the Do Not Disturb feature is turned on. You can also turn on Do Not Disturb to silence incoming phone calls. And with that, you are hereby notified that you’ve survived basic training. The real fun is about to begin.